This species is the "California Sister" formerly called Adelpha bredowii. It occurs in California and the Pacific Northwest. Prudic, K.L., Warren, A.D. & Llorente Bousquets, J. 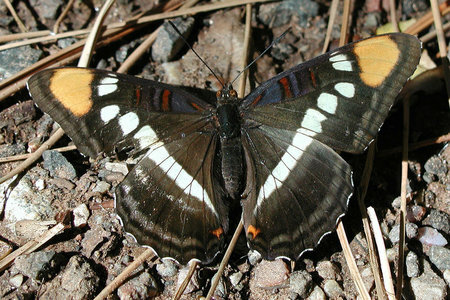 (2008) Molecular and morphological evidence reveals three species within the California sister butterfly, Adelpha bredowii (Lepidoptera: Nymphalidae: Limenitidinae). Zootaxa 1819. 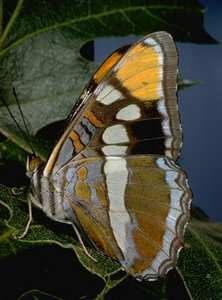 The former species "Adelpha bredowii" has been split into three species. True A. bredowii is endemic to Mexico (Prudic et al. 2008). Page: Tree of Life Adelpha californica (Butler 1865) described in Heterochroa. Authored by Andrew V. Z. Brower. The TEXT of this page is licensed under the Creative Commons Attribution-NonCommercial License - Version 3.0. Note that images and other media featured on this page are each governed by their own license, and they may or may not be available for reuse. Click on an image or a media link to access the media data window, which provides the relevant licensing information. For the general terms and conditions of ToL material reuse and redistribution, please see the Tree of Life Copyright Policies.